These pages are for my good friend Adrian Batty, also a self - confessed Mini nut. He is the Son of my one time Mentor, Wilf Batty, who infected me with this engineering interest virus, for which, I am reliably informed, they have yet to find a cure. I think its medical name is Anoraknophobia. Wilf was the Head of Precision Engineering at the Aircraft factory where I served my apprenticeship, and I have yet to meet a more capable precision engineer. Throughout my life I have made various detours, and met people along the way, who have really influenced my life - Wilf is one of those people, and to whom I must offer my sincere thanks. At the time (late 60's, early 70's) Adrian had a Mini saloon, with all manner of goodies attached to it. Like many of us, he moved on to other things; but now, with hindsight, I realise that these wonderful cars never really left his thoughts. So it came as no surprise to me, when in 2001, Adrian rang me to ask about Minis in general and said that he would quite like to own one again. 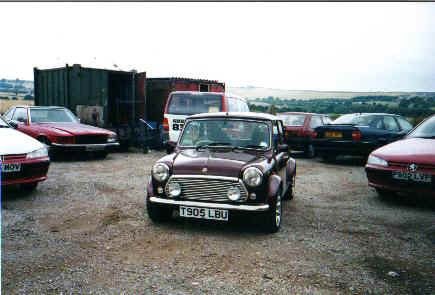 Some time later, when I was visiting Hull, he took me to Nottingham to view a 1999 Mini 40. It really was quite a nice example, but during our test - drive, it pulled like mad to the left - great for negotiating roundabouts on the Continent - but how the hell do you get it there? On inspection there was no real damage to see, except for a wrinkly bonnet slam panel. After much deliberation and being somewhat messed around by the dealer, he did not buy it, but soon found another, with which he is very happy. This one has now been extensively waxoyled, by Adrian himself and only used in the good weather. 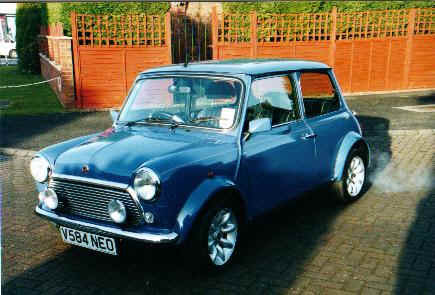 I think it is set to become an appreciating classic amongst the later Minis. I'm sure there will be more information to view soon - watch this space!